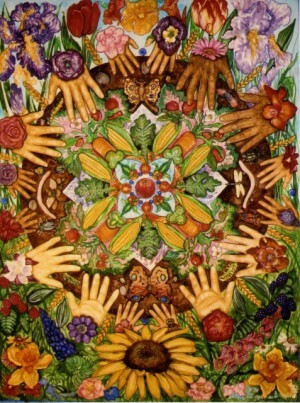 As a mandala aligns the microcosm with the macrocosm, the particular to the universal, so the creator is only the tool of creation, the invisible hand. The majority of images are watercolors with permanent gold and silver ink on paper. Some acrylics with gold and silver paint on canvas are included, as well. Primarily a muralist as a commissioned artist, my work is often of a larger scale. The watercolors are 22" x 26" on average with some much larger. The acrylics tend to be larger still, often 3-5' a side. All images are generated by the artist, by hand as a discipline. Because of this the symmetry is not exact, nor the patterns or images perfect. But they contain the energy and intent of the artist over long periods of time sustained through the creation. The images unfold from an original concept or vision to include elements unconsciously created. These unpredicted elements are often revelatory and most appreciated. Within the circle, the 4 races become the human race, the 4 elements become the earth--and the heavens, aligned as above so below. A great multi-dimensional reality is translated through the simplicity of mandalic form, the paradox of opposites held in juxtaposition, duality reconciled. Thus the illusion of separation reveals the embrace of the male and the female (in their symbolic aspect), a holy marriage is consummated, harmony through conflict brings balance. The point of balance within yin and yang is born, a higher point of the triangle revealed, a point of dynamic equilibrium and ecstatic evolution. First we embrace the female, for it is from her that we are born--of mother, of Mother Earth. We then have the child, the bridging point, product of union, point of synthesis. And, finally, we have the father, Father Sky, source of irradiating light. We are all various parts of the trinity, cycling through its patterns through time. We have thesis, antithesis, synthesis; we experience the pattern of tension and release, of breathing in and out and the holding in between. We create the geometric forms that interrelate in our lives, for every life is a mandalic expression. And through it All, we have love, the magnetic link that unites us and propels us forward in a spiral dance of reunion: a holy family, manifest and unmanifest, in diversity and unity, moving through time and space, together. Help bridge the past through the present to the future, full circle. For in the circle we are atoned, as in healing we become whole.